Oregonians do live in tax hell. This tax season, Oregon taxpayers are sacrificing more of their tax money than most Americans. Oregon ranks as the nation’s fourth-biggest for state government spending, per capita, according to the latest data from the National Association of Budget Offices. That means 46 other states spend less per person than Oregon to fund their governments. The result of having one of the nation’s biggest, richest, and fattest governments is not efficiency or progress. Just the opposite. Rather, our government is too big to function. The politicians spent $58 million on a Wapato jail that was never used, $175 million on a Columbia River bridge that was never built, $298 million on vacant government jobs for employees who never worked, and $300 million on a health care website that was never used. If, on a per capita basis, Oregon politicians have more available tax money to spend than 45 other states, then why do we have one of the nation’s worst graduation rates? Why did we give early release to dangerous criminals — putting 300 back on the streets in the past few months? Why are politicians talking about tolling Interstate 5 and I-205 to pay for roads? What is the benefit of having one of the biggest governments in America if it means our kids aren’t learning, criminals are not behind bars, and our roads are no longer free? The other tragic result of having one of the nation’s fattest governments is that it brings to light the dirty secret tricks politicians use to rob us of more tax dollars. For instance, raising fees has become the new backdoor tax increase. In 2017, the Oregon Legislature raised more than 586 fees in a single year. That alone soaked taxpayers for a half billion dollars. Our website, Oregon Watchdog, has archived nearly 20 years of government waste of tax dollars, and I am here to tell you that the problem is only growing worse. The answer to government waste and overspending is for Oregon to adopt spending limits, term limits, and a public right to vote on all new major tax increases to stop the soaring growth of government spending. I hope you agree. — Help us fight tax increases in the State Capitol as we have done for 20 years!!! — Make a donation to the Taxpayer Association of Oregon. Oregon among top 20 biggest spending states in the nation! 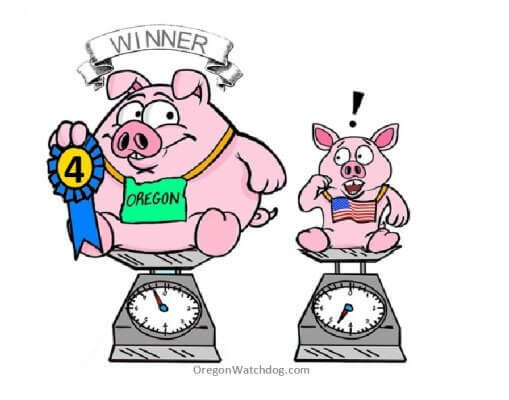 Oregon: 2nd fastest growing government!